Organic forms, integrated LED light bands and lightweight construction: we have deviated from the well‐trodden roads in furniture construction and have redefined our vision of freedom. 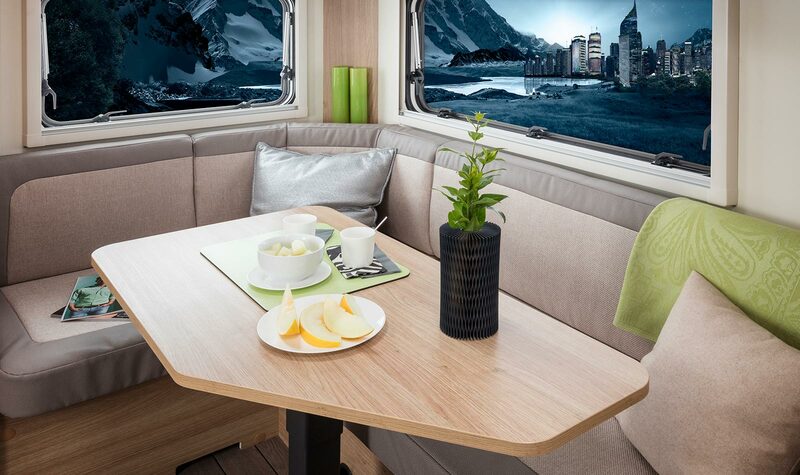 In doing so, we have developed a revolutionary interior with which we are launching a new era in caravan construction. Perfection all round. The interior design convinces with organic geometries, integrated LED strips and cube constructions setting absolutely unique new standards. Discover it for yourself. The keyword „UltraLight‟ combines all the lightweight construction themes. Aside from well‐known things such as sandwich construction or multi‐core materials, the applied materials and processes such as COLDMELT technology, RevolutionCube or PowerAxle‐Chassis do not only open new possibilities, but overall they also carry the implementation of a fully operational 4‐person caravan with 750 kg of empty weight. However, the star of the TRAVELINO is the new FibreFrame whose fibre elements are extremely torsion‐resistant and variable. Ultrasonic speed – also in the interior design. 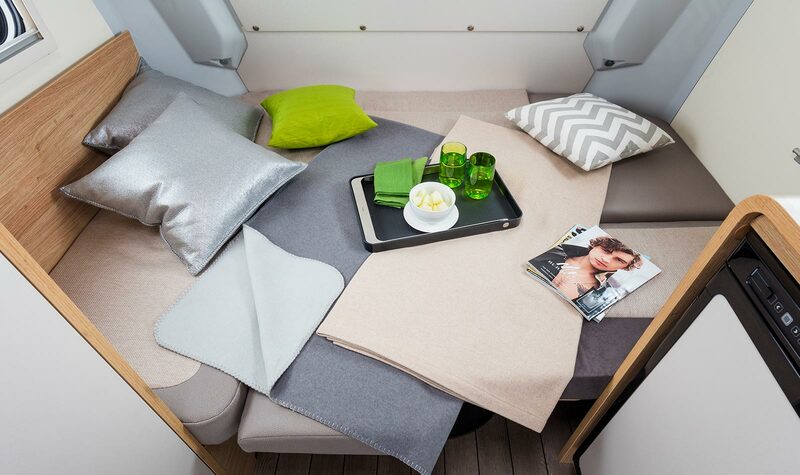 EPP is an entirely new extremely lightweight, strong and stable material which has never been used in caravan furniture construction before: expanded polypropylene. Through ultrasonic energy (COLDMELT‐Technology*) so‐called KALTSCHMELZ® dowels are connected to the lightweight carrying material in a high‐tensile fashion. This connection technology enables us to achieve maximum strength and stability despite the ultra‐light weight of the construction materials (multi‐core plates). Lightweight chassis technology. With 35% less mass than a comparable conventional chassis, the PowerAxle picks up speed in the direction of hybrid and e‐mobility in caravanning. 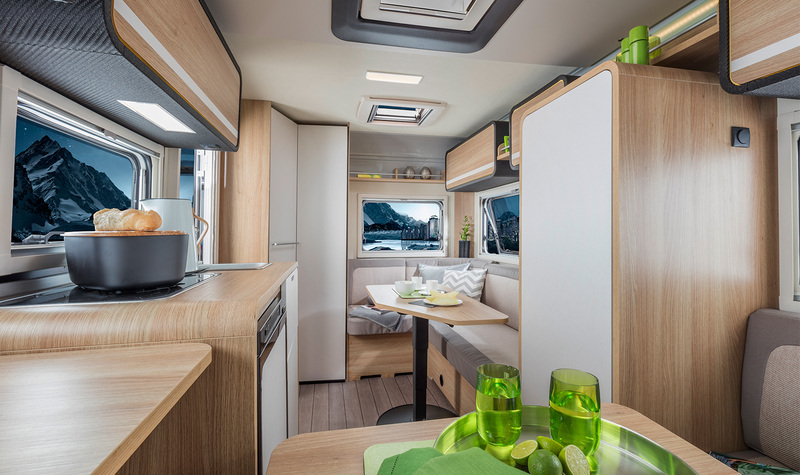 In addition, the innovative chassis technology provides the caravan with unprecedented driving dynamics which is at home in the fast lane. Patented frame technology. For half a century caravans were built in a particular manner. KNAUS laid a new foundation stone by developing a self‐supporting frame which makes furniture just furniture and no longer stabilising elements. This enables fully new approaches and unexpected flexibility in the design of the layouts and in the placement of the furniture. The new lightness. 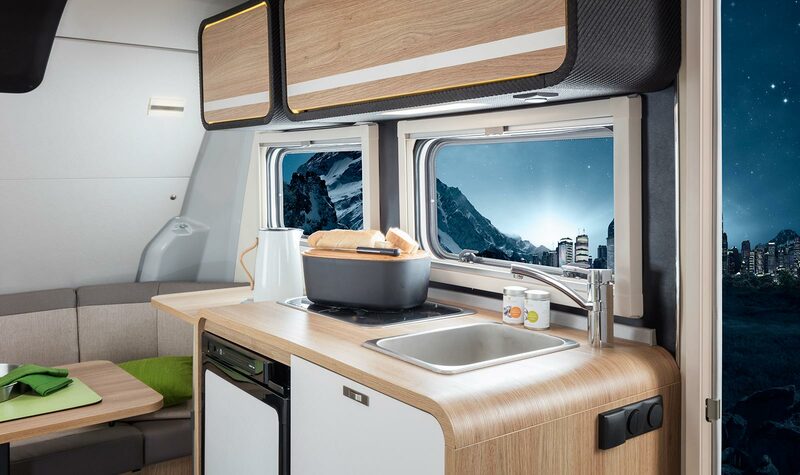 Thanks to EPP materials, clever sandwich structures, revolutionary multi‐core constructions and the combination of frame and chassis technologies the TRAVELINO is a fully operational 4‐person mobile home with 750kg empty weight. * The connection technology is based on the patented WoodWelding® technology developed by WoodWelding SA and is sub‐licensed by Adolf Würth GmbH & Co. KG.